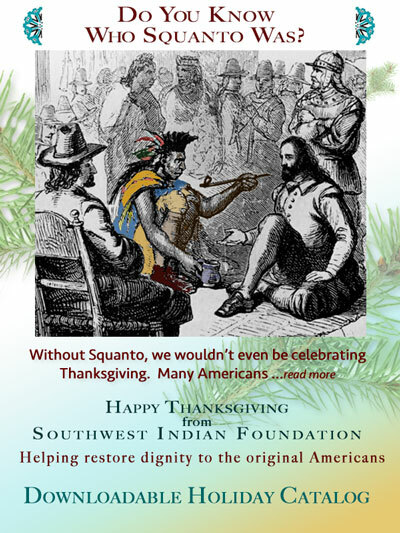 Without Squanto, we wouldn't even be celebrating Thanksgiving. Many Americans are not aware of why we take time out each year to give thanks for our many blessings. We can easily miss the true meaning of Thanksgiving. After a brutal and life threatening winter in 1619, Squanto taught the Pilgrims at the first English Settlement, native methods of planting and how to fertilize crops. He also taught them how to fish. Because the settlers survived with the help of Squanto, they celebrated with a special celebration in honor of Squanto...the first Thanksgiving. Years later even the hard-nosed Governor William Bradford stated: "The death of Squanto was a great loss". May we all remember Squanto and his kindness this Thanksgiving. We wish you a Happy Thanksgiving with bountiful blessings and a cornucopia of good wishes.